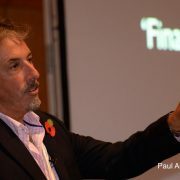 BACK2Y – literally, “Back to why [you do it]”, i.e advise clients – returns this year after its organiser Paul Armson’s alternative conference of the same name launched in 2014. Last year, a room at the Birmingham Hilton Metropole just about held 198 for the one day event. This year, in response to demand, Armson (pictured) has booked more space at the city’s International Convention Centre, upped the number of speakers and is hopeful of 350-plus attendees. The format of adviser conferences tends to be predictable: the latest practical information and opinions are imparted, mainly from providers, together with rehashed gripes and with a couple of motivational speakers thrown in. The ‘industry’ wants advisers to give clients what it wants – product distribution. It’s time to wake up! BACK2Y was an altogether much more emotive event. The allure, according to those who went, was the promise of a space to share ideas at what the participants consider to be the vanguard of financial advice. Speakers spoke evangelically of epiphanies turning them away from transactional advice, the practice of selling products to meet clients’ perceived needs so ostracised by today’s financial planning frontline. ‘Product’ is a dirty word at BACK2Y, and product providers, with their stands offering free stuffed animals and mugs in exchange for five minutes bending your ear about their latest ‘solution’, are banned. The lack of corporate sponsorship is reflected in the price, with currently available tickets for this year’s one day event ranging from £297 to £347. The conference does sell something though – professional elitism. “Most advisers won’t get BACK2Y. But that’s OK. It only takes a few to start a revolution,” Armson said. Armson is a part-time financial adviser and CEO and founder of Inspiring Advisers, a coaching programme in which he teaches advisers “how to really succeed as a lifestyle financial planner”. BACK2Y is an extension of the philosophy Armson preaches in his adviser training company. “Inspiring Advisers can show you how to WOW! your clients in return for vastly increased fee income – and have a lot of fun in the process,” according to its website. Mrs Miggins seeking advice on what to do with a pension pot of £50,000 – low, but sadly above the national average – probably isn’t going to be able to afford that vastly increased fee, so presumably only advisers with a large proportion of pretty wealthy clients need apply. Not a criticism, but a reality. Armson himself ‘semi-retired’ in 2005 at the age of 45 and split his time between advising clients and sailing “Spellbound”, his 60 foot Oyster yacht, around the world. In between that he spent three years working alongside Prestwood Group’s Paul Etheridge, founder of the Institute of Financial Planning and darling of those who consider themselves to be the more progressive element of the advice world. The two created the much lauded cash-flow modelling tool Truth Financial Planning Software. Armson’s aim with BACK2Y is to marry up acting in the best interests of clients with acheiving professional nirvana for advisers. “I wanted to create an event to bring together advisers who also believe that it’s all about the client and helping them get what they want,” Armson said of BACK2Y. “It’s called BACK2Y because it helps take advisers back to what we should be doing for clients – providing peace of mind, financial security, helping clients live life to the full, helping them get and keep their desired lifestyle. Armson draws his battle lines on these terms; there is “no real value” in providing clients a product or investment based service. “What clients really want to know is: ‘in return for your fees how are you going to make my life better? '” he said. That is probably a fair assessment of any exchange of hard-earned money for goods and services. Armson’s point is that financial services has been lacking in this respect. “The ‘industry’ wants advisers to give clients what it wants – product distribution. It’s time to wake up! Advisers are being paid by the client, so we have to give clients what they want – which isn’t products or investments. The demise of commission brought on by the RDR shifted the power dynamic from advisers relying on providers for an income, to the other way around. BACK2Y is a product (pun intended) of that change. It’s “vibe” might not be to every advisers’ taste, but beneath all that, the fundamental premise of a conference delivered by advisers, for advisers, focused on financial planning, has to be applauded.